Have you ever tried to build a sandcastle with dry sand? As kids, we learn quickly that pouring more and more dry sand on a crumbling sand hill will never help us build the epic fortress we dream of. As you add sand to the top, the bottom grains just slip away. Building up is only possible if you have a strong foundation and a system that will help constantly fortify your creation. Educate customers well during onboarding so they learn how to best use your product. Engage savvy customers to drive them deeper into your product. Empower power customers to make them invaluable advocates for your brand. Here are ten ways to increase customer retention and turn your app from a sand slope into a fortress. Onboarding is hands down the most important part of a customer's journey. Not only does it set your customer up to succeed—or fail—but it also gives you the opportunity to show off the best use-cases of your product. But too often, product people associate onboarding with new customers. They assume that they have one shot to educate customers on everything there is to know, and if they don't do a thorough job then they're doomed. This results in an overwhelming tutorial that customers ironically never finish. Instead, a customer's initial onboarding should be short and sweet, leaving the rest for careful nudges throughout a customer's lifecycle. Here's how to tactfully onboard customers without scaring them away. According to recent studies, first impressions often trump cold hard facts. As humans, we're hardwired to form lasting opinions based on gut instincts. This means that the welcome message is a highly critical first part of onboarding. 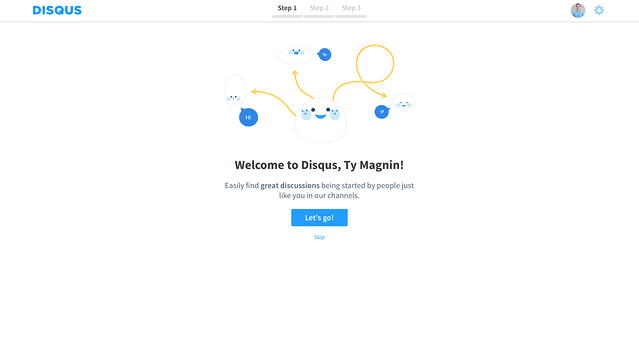 Take a look at how website tooling app Disqus starts onboarding on a great note. It's personal. The welcome message leverages the familiarity principle to make customers feel like they're being addressed directly. It has a clear purpose. The message clearly and succinctly states the purpose of the upcoming walkthrough, so customers can decide whether it's relevant. The finish line is in sight. Seeing that this walkthrough is only three steps incentivizes customers to stick around and hear you out. Most importantly, it doesn't have a lot going on. Don't clutter the screen with modules and nav bars. Set the tone by easing your customer into a pleasant experience with your app, not by throwing all your app's use cases in their face. A great first product tour is like a great highlight reel. You have to show them the best bits that fit together into a cohesive storyline. But tread carefully, because throwing too many “helpful” suggestions at customers can be disorienting. Instead, use modal windows to deliver only critical information and cues as suggestions relevant to their current workflow. Take a look at how Facebook Business accomplishes this. The first pop-up shows how to navigate in and out of the site. customers can learn more about navigation in this walkthrough, but they're guaranteed to at least know the most critical piece of information—how to get into the page. An Aha! moment is when a customer finds value in your app. They might realize how easy the uploading functionality is and decide that your app is their go-to picture storing, or that they love the chatting functionality and want their whole team to join. Every app has several AHA!-moment inducing features, and your goal should be to constantly nudge customers to discover them. 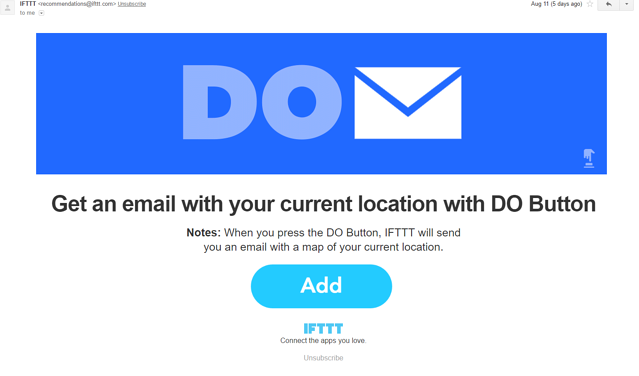 Take a look at this example from IFTTT. 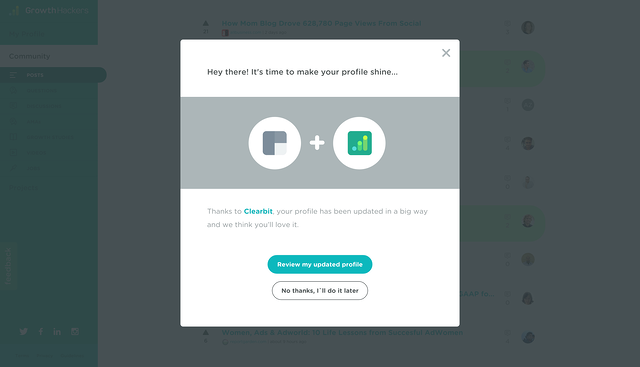 This suggestion is sent to all active IFTTT customers, educating customers at all stages of their lifecycle and nudging them toward this AHA! moment. Never stop onboarding with these nudges to make sure every customer knows how to best take advantage of your product. Millennials are more receptive to change than any other previous generation, and chances are, many of your customers fall into this group. This means that gone are the days of customers sticking to what they're used to. The marketplace has become meritocratic—you have to work twice as hard to get customers to stay interested. So once you've nailed down the onboarding, you have to keep customers engaged to remind them of your app's value. But the line between pestering and helpful is thin, so your outreach has to always be relevant and valuable. Here's how to engage carefully. The great thing about SaaS is that the product is flexible. You're not stuck with the app you first created that is doomed to be wedged out of business. Use updates as a way of letting your customers know that you're on top of your product game. Here's an example from GrowthHackers—a platform for growth professionals—when they integrated with business development tool Clearbit. Clearbit is an API that lets companies access information on any business or professional, so it enabled GrowthHackers to let customers add much more detail to their profiles. GrowthHackers didn't let this valuable upgrade fall by the wayside, but rather used it as an opportunity to offer customers more out of their product. Most founders say that reaching out to your customers is the best way to keep them engaged. But you don't need to wait until your semi-annual feature release to have a reason to reach out. 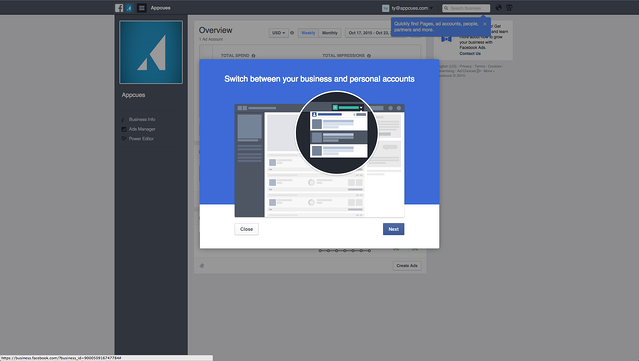 Give customers updates on their behaviors and check-ins to remind them of your existence. 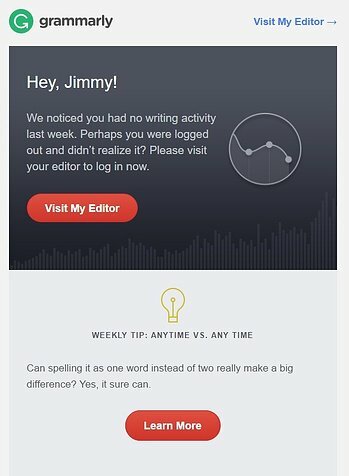 By sending a weekly rundown, Grammarly sets the customer up to regularly expect useful information. This keeps their app front of mind, and gives Grammarly a reason to send along helpful suggestions when necessary. You want to offer your customers as much value as possible, and it doesn't stop with your product. Surviving in the B2B SaaS world isn't easy, which makes insight into a business that works all the more valuable. Share your wisdom from your own B2B SaaS experience so that your customers can come to love your brand and trust your voice. Of course, great lead-generating content is hard to come by, so make sure you have a team of dedicated writers and researchers to work on this. Facebook advertising tool, AdEspresso, has gained a reputation as the experts on Facebook ads because of the resources they deliver their customers. AdEspresso customers get more than just a Facebook ad tool—they get an unlimited supply of invaluable online marketing tips. In an ever-changing, volatile environment, this is more than enough to get customers to stick around. The key to giving customers relevant information is to make sure you give it to them in the right context. Offering an upgrade for more storage during week one will come across as self-serving, but offering the same upgrade when they run out of space, will come across as useful. 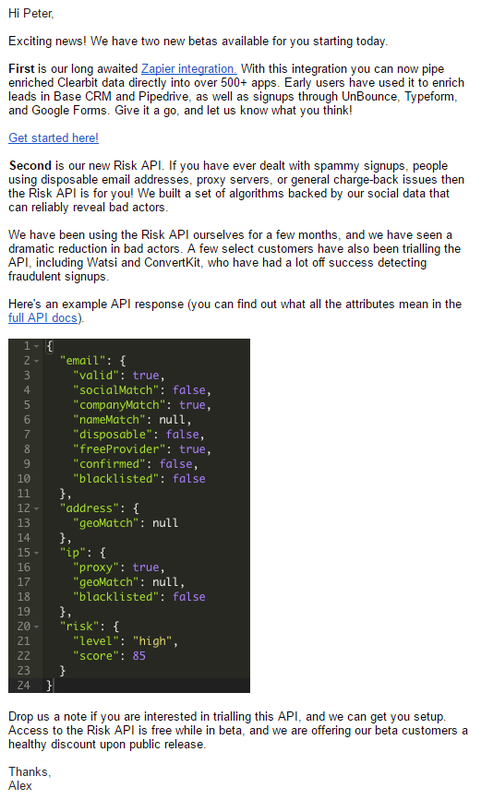 Take a look at how Hubspot's email-tracking tool Sidekick accomplishes this. Right when you reply to an email to set up a meeting, Sidekick offers its tool that streamlines this process. In context, this is a tempting offer that doesn't come across as intrusive. Happy customers are great, but why stop there? Aim for customers that are so smitten by your product that they're as far from churning as possible. Then, they'll not only be your most loyal customers, but they'll tell their friends. You can turn engaged customers into brand advocates by giving them influence over your product. This way, they'll feel invested in your product and ultimately prove instrumental to improving it. Your goal is to get your app to be a perfect fit for your customers, but this is only possible if you learn as much as possible about your customers' needs. But with customers on guard against data-hungry marketers, this is easier said than done. Use surveys to learn more about your customers, so you can cater your outreach to them as much as possible. But be especially careful to explain that you're doing this to improve their experience, not your app. 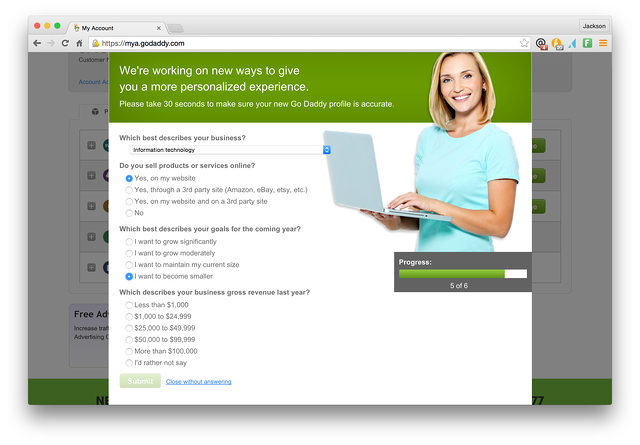 Here's GoDaddy's approach. They put their intentions up front and center—“to give you a more personalized experience”— so that customers don't fear that they're being scoped out. There's nothing better than getting first dibs on a new product. Make your best customers recognize how valuable they are to you by letting them try out a beta product. This lets them feel like they're part of the team, and aligns their want for a better product with your aim to build one. Take a look at the beta offer from our friends at Clearbit. Not only do they give select customers special beta privileges, but they promise a discount as an added thank you. This incentivizes customers to try out the new product and makes them feel like valued customers. While you might be the ultimate expert on the inner workings of your product, your customers are the best at actually implementing it. Enable customers to learn from each other by setting up forums or places to comment on your blog. This makes their experience with your brand personal, making it all the harder to leave it. 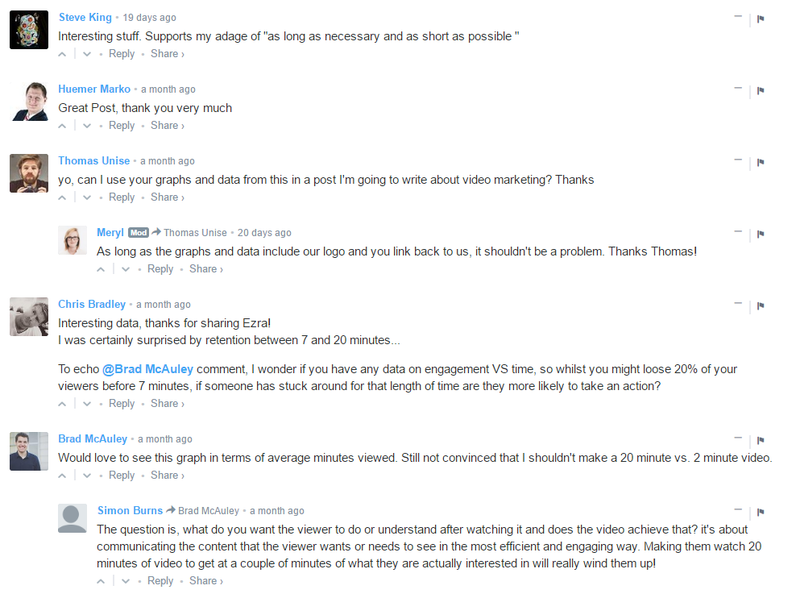 Video hosting platform Wistia has done a great job at facilitating inter-customer communication. On all their handy how-to videos and blogs, they enable commenting so they can see how their audience is using their product and advice. Wistia even has a Slack channel that they invite all their customers to join, making the Wistia experience all the more personal. Ultimately, your customers want a useful product, and you want to give it to them. You know that your customers are interested since they signed up—so all you have to do is not blow it. 55% of consumers reported that easy access to helpful information will make them fall in love with a brand. That means over half of your customers would be thrilled to find more use out of your app.